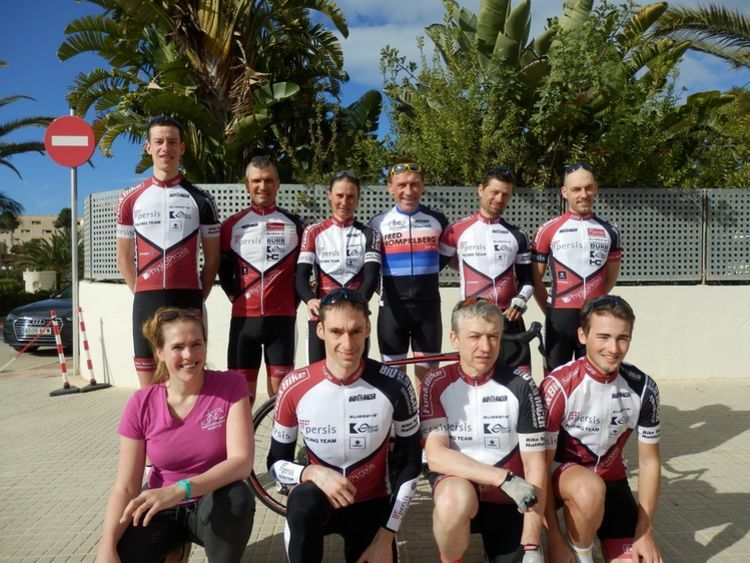 Laatste Nieuws over Fred Rompelberg Bicycling Team Mallorca >> Fred Rompelberg 268 km. 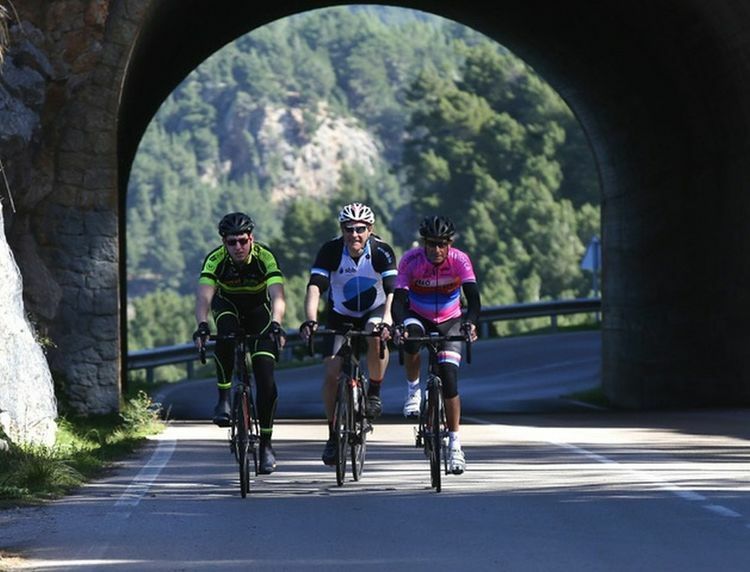 Our guests say: Mallorca the true cycling paradise! FORMIDABLE. Onze gasten zeggen: Mallorca het ware fietsparadijs! FORMIDABEL. We zijn nu aan het eind van de 5e week op Mallorca gekomen. De gasten die terugkeren naar huis zijn allen zeer enthousiast en zijn het er over eens dat het totaalproduct Mallorca Fred Rompelberg 268 km FORMIDABEL is. We zijn in het najaar op Mallorca van 14 september tot 28 oktober 2018. Als je voor 30 april 2018 boekt, boek je nog met vroegboekkorting voor deze periode. Op dit moment hebben we al 20.5% meer boekingen dan vorig jaar. ****Goede wieler mecaniciens zijn altijd welkom in ons team op Mallorca! Ook: ritten op woensdag en zaterdag! Er zijn ook groepsritten die plaatsvinden op woensdag en zaterdag. Voor degenen die niet genoeg hebben aan 4 dagen fietsen zijn er dan groepsritten. Op woensdag rijdt de tourgroep vanuit Pollenca naar Cap Formentor en terug naar de Playa de Palma en de Cappuccinogroep heeft een familierit naar Palma op de planning staan. Voor het volledige programma raadpleeg je tijdens je vakantie onze informatieborden bij de shops. Mark Rutte, onze minister-president was in Maastricht voor zijn reclamecampagne voor de komende verkiezingen. Rutte werd bijgestaan door John Aarts, wethouder van Maastricht van Economie, Evenementenbeleid, Mobiliteit, Financiën, Vastgoed, Personeel & Organisatie. Queen: Claudia Geiseler, uit Oranienburg, Duitsland met 475 km in 5 dagen. King: Joris Luys, uit Meeuwen, België met 734 km in 5 dagen. Rien de Greef uit Maarsbergen, Nederland. Rien was vorig jaar voor het eerst te gast bij ons op Mallorca. Zijn vrouw was overleden en hij zocht een nieuwe manier van op vakantie gaan. Hij ging alleen op vakantie, maar was tijdens zijn eerste ervaring bij ons gelukkig nooit alleen. Dit jaar kwam hij met zijn zoon en dochter samen. Sonja Weller uit Dortmund, Duitsland. Henk en Lizette Zoontjes. Bedankt voor jullie leuke reactie! Unsere Gäste sagen: Mallorca ist das wirkliche Fahrradparadies! FORMIDABEL. Wir haben jetzt das Ende der 5. Woche auf Mallorca erreicht. 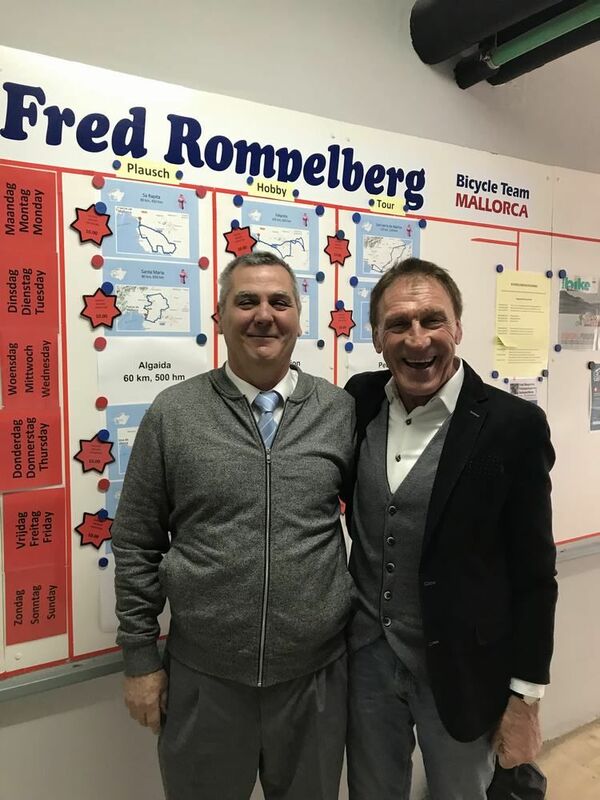 Die Gäste, die nach Hause zurückkehren, sind alle sehr begeistert und sich darin einig, dass das Gesamtprodukt Mallorca, Fred Rompelberg 268 km FORMIDABLE ist. Wir sind im Herbst 2018 vom 14. September bis zum 28. Oktober auf Mallorca. In diesem Moment haben wir schon 20.5% mehr Buchungen wie letztes Jahr. ****Gute Fahrradmechaniker sind immer willkommen in unserem Team auf Mallorca! Auch: Geführte Touren am Mittwoch und Samstag. Da sind jetzt auch geführte Touren an am Mittwoch und Samstag. Für derjenigen die mit 4 Tagen Radfahren nicht zurecht kommen, gibt es dann auch Touren. Am Mittwoch fahrt der Tourgruppe z.B. zur Cap Formentor ab Pollenca und geht der Cappuccino-gruppe nach Palma für eine Sightseeing. Fürs komplette Programm sehen Sie den Informationsbrett bei unsere Shops. Mark Rutte, unser Premierminister, war in Maastricht für seine Werbekampagne für die bevorstehenden Wahlen. Rutte wurde unterstützt von John Aarts, Beigeordnete von Maastricht für Wirtschaft, Event Policy, Mobilität, Finanzen, Immobilien, Personal und Organisation. Königin: Claudia Geiseler, aus Oranienburg, Deutschland mit 475 km in 5 Tagen. König: Joris Luys, von Meeuwen, Belgien mit 734 km in 5 Tagen. Rien de Greef aus Maarsbergen, Niederlande. Rien war letztes Jahr für die erste Mahl bei uns auf Mallorca. Seine Ehefrau ist gestorben und er suchte eine neue Weise um in die Ferien zu gehen. Er war alleine in die Ferien, aber während seine erste Erfahrung bei uns nie alleine. Dieses Jahr kam ehr mit seine Tochter und Sohn zusammen. Sonja Weller aus Dortmund, Deutschland. Henk und Lisette Zoontjens. Danke für Ihre positive Rückmeldung! Our guests say: Mallorca the true cycling paradise! FORMIDABLE. We have now reached the end of week 5 on Mallorca. 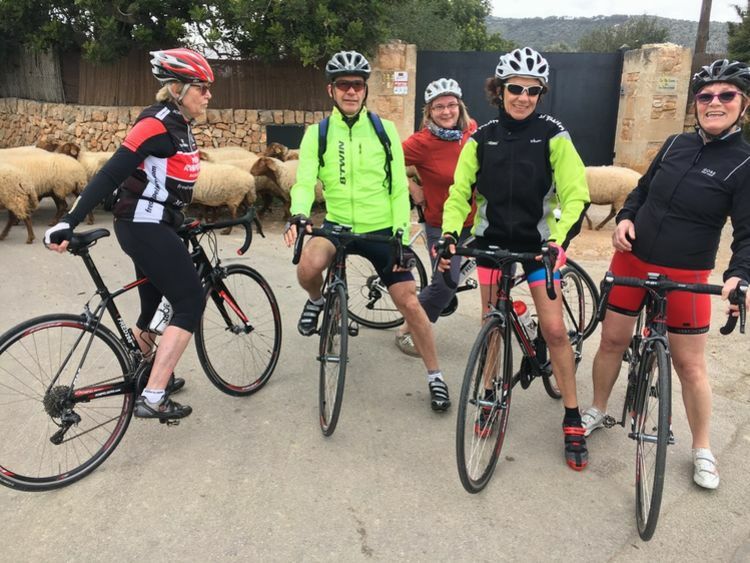 The guests that return back home are very enthusiastic and agree that the overall Mallorca package, Fred Rompelberg 268 km, is AMAZING. In fall 2018, we will be on Mallorca from September 14 to October 28. At this moment we allready have 20.5% more bookings than last year. ****Good mechanics are always welcome in our team on Mallorca! Also: Guided tours on Wednesday and Saturday. We also have 6 guided tours a week. For those who can’t get enough cycling in 4 days, we offer rides on Wednesday and Saturday as well. For instance, the tour group will head for Cap Formentor with start in Pollenca and the Cappuccino group will go to Palma for some sightseeing. For the complete programme during your holidays, please look at our informationboards at the shops. Mark Rutte, our Prime Minister was in Maastricht for his advertising campaign for the upcoming elections. Rutte was assisted by John Aarts, alderman of Maastricht for Economics, Event Policy, Mobility, Finance, Real Estate, Personnel & Organization. 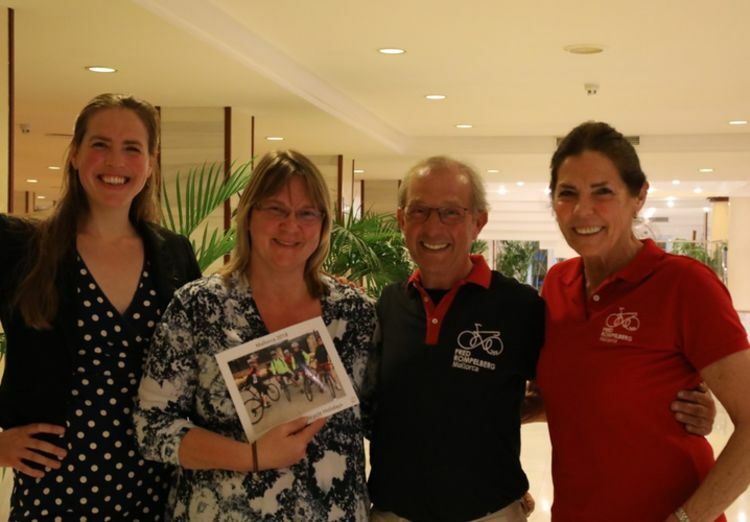 Queens: Claudia Geiseler, from Oranienburg, Germany with 475 km in 5 days. King: Joris Luys, from Meeuwen, Belgium with 734 km in 5 days. Rien de Greef from Maarsbergen, the Netherlands. 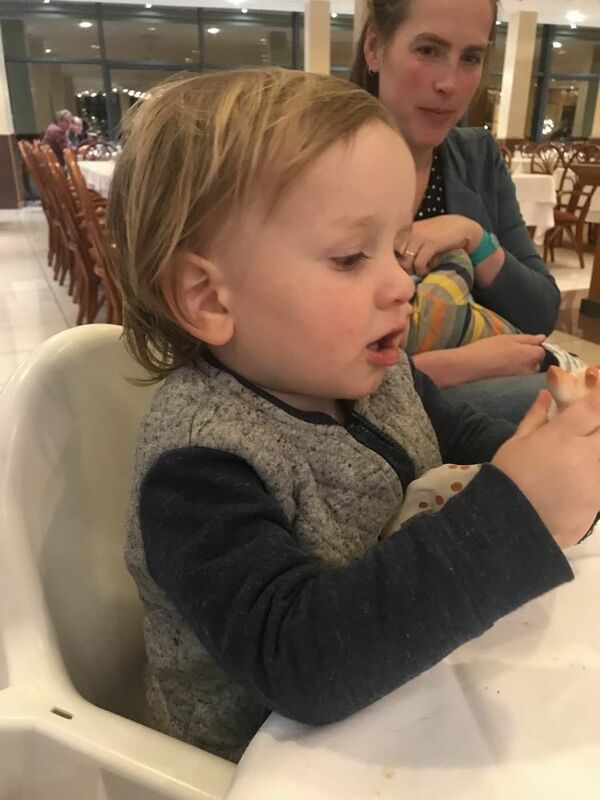 Last year, Rien was with us on Mallorca for the first time. His wife passed away and he wanted to find a new way of going on holiday. He came to us alone, but during his stay he was never alone. This year he is with us with his son and daughter. Sonja Weller from Dortmund, Germany. Henk and Lisette Zoontjens. Thanks for the positive feedback! Mark Rutte, Fred 268 km and John Aarts and an unknown person. 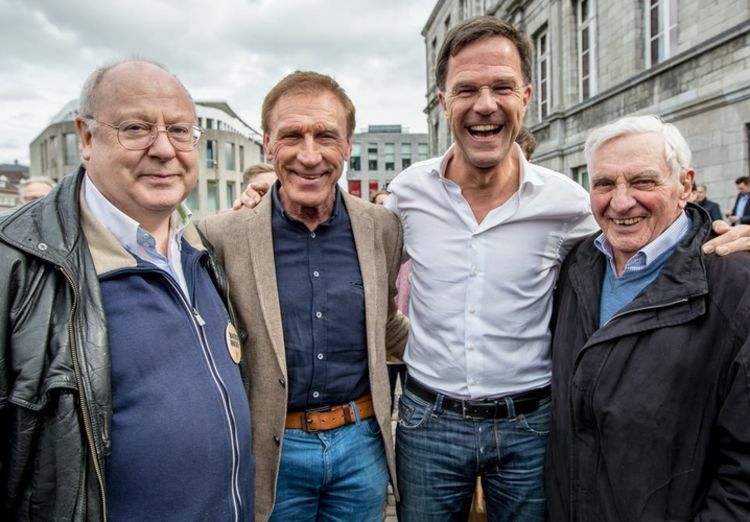 Mark Rutte, Prime Minister from the Netherlands, was in Maastricht for his advertising campaign for the upcoming elections. Rutte was assisted by John Aarts, alderman of Maastricht for Economics, Event Policy, Mobility, Finance, Real Estate, Personnel & Organization. Little Lieuwe son of Letizia and Jetse. Watched by Letizia. 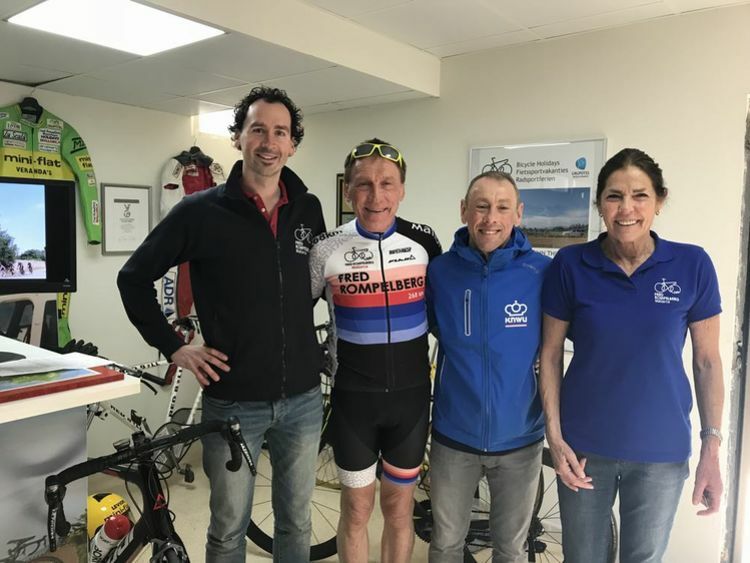 In the picture: Jetse Scholma, Fred 268 km, Steve McEwen and Tiny Rompelberg. 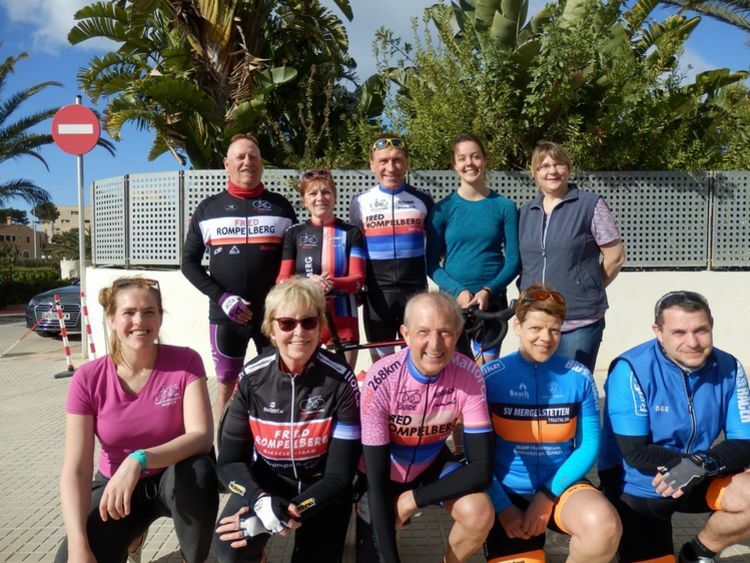 Steve McEwen is Talent Coach TrackSprint from the KNWU, The Royal Dutch Cycling Federation.Steve is currently with us on Mallorca with 16 sprinters to prepare the cycling season. 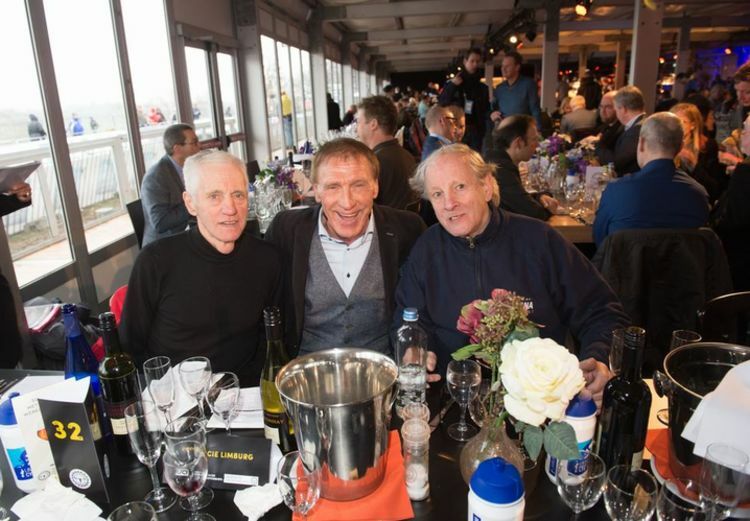 We wish Steve good health, good luck and a very good result with his sprinters this year. 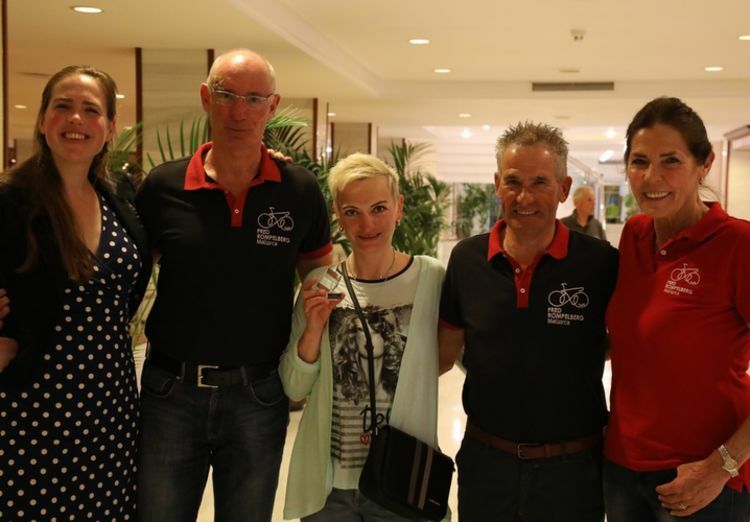 Our weeks queen: Claudia Geiseler, from Oranienburg, Germany with 475 km in 5 days. Letizia Rompelberg, Wolfgang Faber, Claudia Geiseler, Felix Verhoeven and Tiny Rompelberg. Our weeks king: Joris Luys, from Meeuwen, Belgium with 734 km in 5 days. Letizia Rompelberg, Herman Janssen, Joris Luys, Xavier Vanhaeren, Daan Maggen and Tiny Rompelberg. Photo compition week winner: Sonja Weller from Dortmund, Germany. Letizia Rompelberg, Sonja Weller, Marc Michaux and Tiny Rompelberg. Special story of the week winner: Rien de Greef from Maarsbergen, the Netherlands. Letizia Rompelberg, Mariska, Rien and Bas de Greef, Felix Verhoeven and Tiny Rompelberg. Photo send by Henk and Lisette Zoontjens. 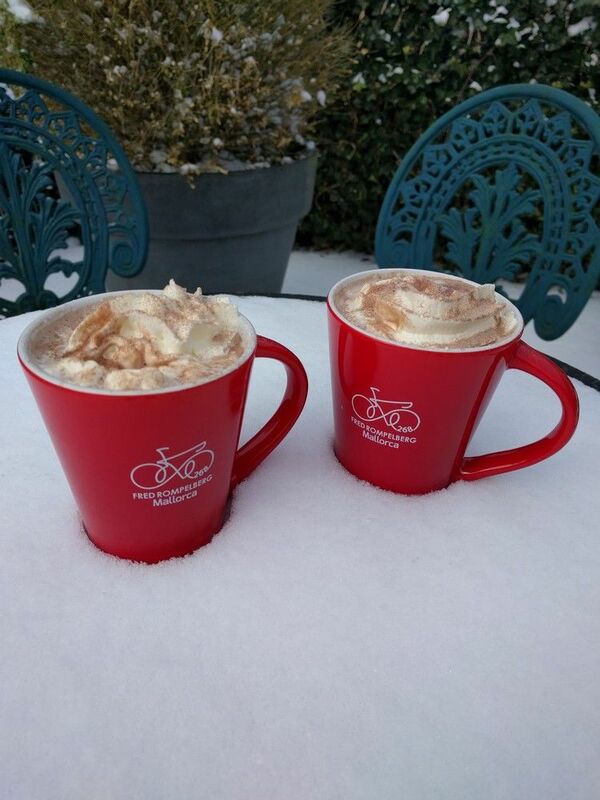 The cups that all our guests from Mallorca get when they go home after their cycling-holiday! These cups are highly appreciated by our guests. Photo by: Henk and Lisette Zoontjens. Overall manager Guillermo Cerda from the Hotels Taurus Park, Orient, Playa de Palma Suites & Spa and Acapulco. Guillermo is already many years in the hotel industry. Guillermo we wish you a very good health and for many years with us as manager of these 4 hotels! Here with Fred 268 km on the picture. Ángel Expósito head of the reservations of hotel Taurus Park. Angel, who every year thousands of guests in hotel Taurus Park for their hotel rooms reserved. He does that alread for many years, is a professional top specialist. Angel we wish you a very good health and many years with us in hotel Taurus Park, here with Fred 268 km in the picture! Hermanus Ellenbroek with Felix Verhoeven was our guest last week. He made beautiful photos during the tours. Check his facebook site: Hermanus Ellenbroek. The professional cyclists Ger Harings Dutch champion on the road with the juniors and the amateurs, stage winner in the round of Spain together with Rolf Wolfshohl from Germany, world- and national champion and a good road racer, during the World Championship Cycle-Cross in Valkenburg in January 2018, together with Fred 268 km in the in the picture. The group of Stephan Schiele from Germany. Stephan comes already many years to us to Mallorca to cycle with his guests on our cyclingparadise. He is ready to make a nice tour. Florian Knoblauch, Florian Rothe, Kati Rothe, Fred 268 km, Stephan Schiele, Tobias Steinwinter, Letizia Rompelberg, Philipp Rogler, Stefan Frank and Julian Ciupke. The group of Antony Stapleton from Great Britain. Antony comes already many years to us to Mallorca to cycle with his guests on our cyclingparadise. He is ready to make a nice tour. 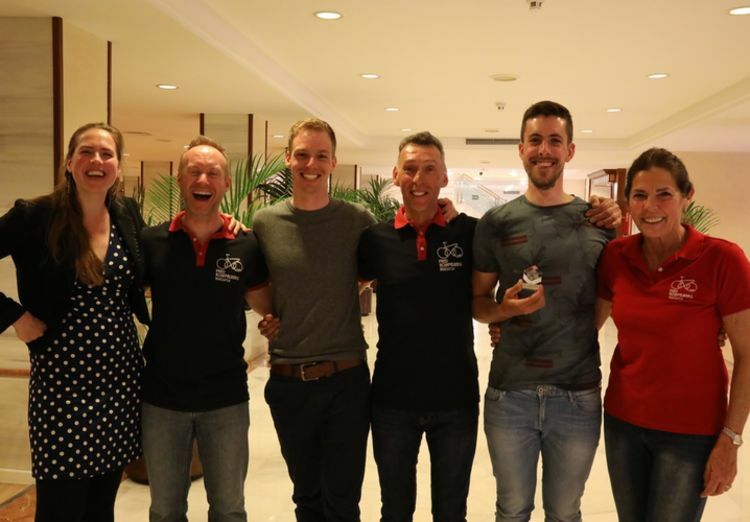 Letizia Rompelberg, Alex Eason, Peter Geau, Antony Stapleton, Fred 268 km, Sam Wghtman, Keith Dorling, Dave Kerry, Matthew Cooke, Russell Tribley, Barry Simpson, Dave Thorpe, Nick Watson, Glenn Taylor, Howard McAlpine, Peter Tibbitts, Paul Donegan, Duncan Gilbert, John Golder, Steve Murphy, Martin Canes and Peter Barton. The group of Oliver Schanz from Germany. 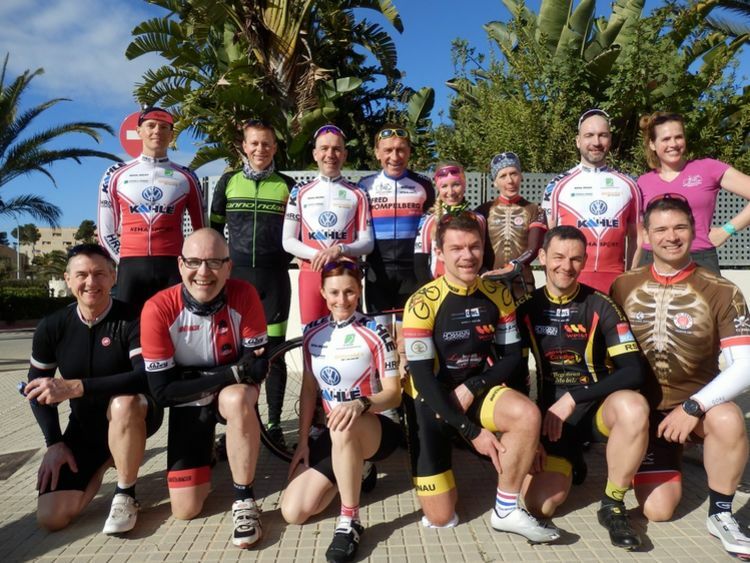 Oliver comes already many years to us to Mallorca to cycle with his guests on our cyclingparadise. He is ready to make a nice tour. Matthias Grutke, Steffen Plapper, Oliver Schanz, Fred 268 km, Mareike Klingenberg, Beatrix Kohler, Detlef Lilje, Letizia Rompelberg, Jens Bliß, Thomas Klaproth, Eva-Maria Boden, Martin Schanz, Michael Ruffer and Thomas Beetz. The group of Martin Zimmt from Germany. 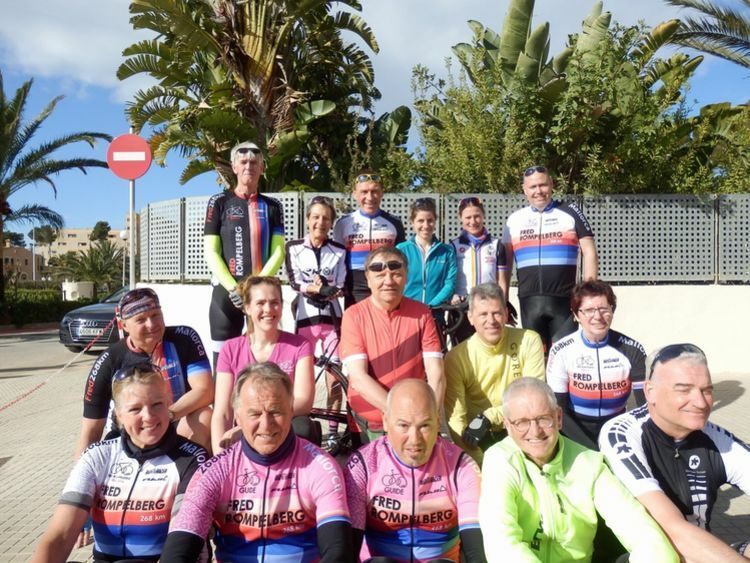 Martin comes already many years to us to Mallorca to cycle with his guests on our cyclingparadise. He is ready to make a nice tour. Markus Goettken, Michael Bacher, Martin Zimmt, Fred 268 km, Markus Pfeffer, Achim Fetzer, Letizia Rompelberg, Sascha Gebhardt, Michael Piller, Andreas Niess, Oliver Konig, Stefan Hulsmann, Thorsten Paulus, Stefanie Grimmlisch, Katharina Kehren, Annette Croonen, Wibke Goettken, Mechtild Hülsmann and Thomas Sautter. 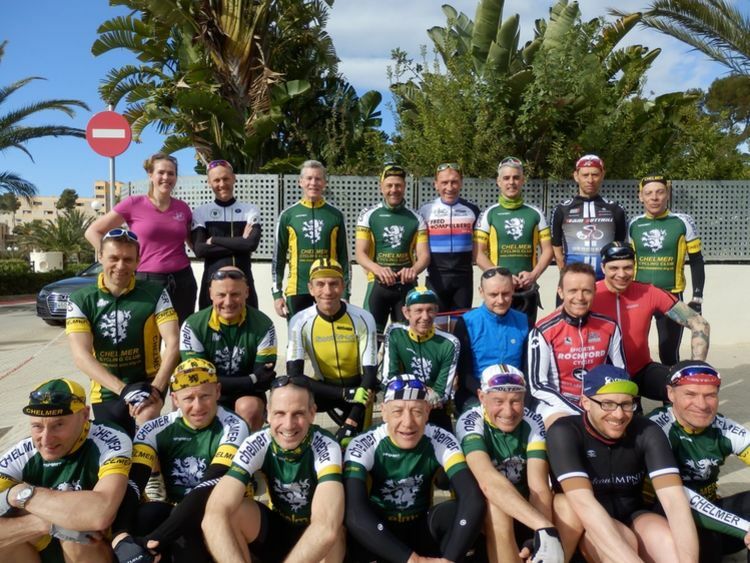 The group of our teamleaders Herman Janssen, Gerhard Silberer, Fred Cremers and Xavier Vanhaeren ready to go with our hobby cyclists to make a nice tour on Mallorca. Lennarte Houten, Jos Voncken, Fred 268 km, Rob Swenne, Daan Maggen, Joris Luys, Herman Janssen, Marco Houten, Lodewijk van Grimbergen, Letizia Rompelberg, Gerhard Silberer, Fred Cremers, Xavier Vanhaeren, Ed Meerburg and Hugo Derks. Letizia Rompelberg, Bas de Greef, Fred 268 km, Carsten Muller, Bodo Weller, Hans Dekker, Willy Guldentops, Rien de Greef, Carla Voncken, Wilm Werkman, Stefan Horemans, Patrick van Dyck, Walter Hufkens, Mariska de Greef, Jef Compere, Felix Verhoeven, Hugo Baras and Wolfgang Faber. 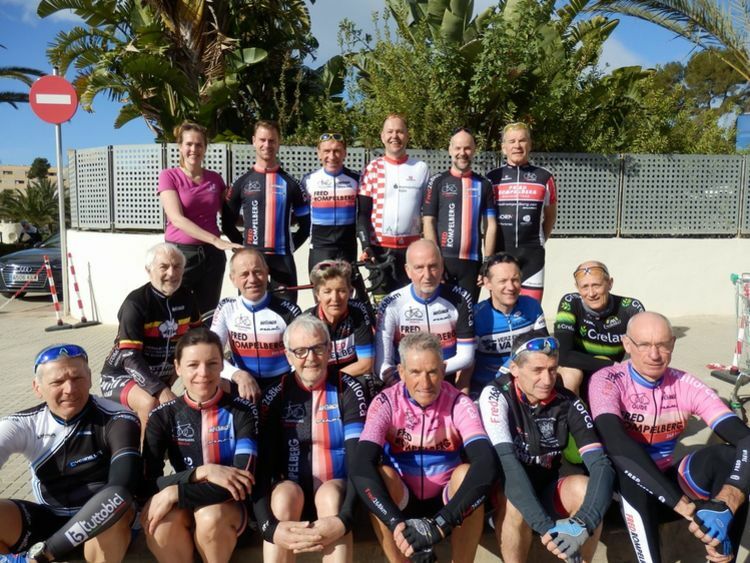 The group of our teamleaders Henk Huijnskens and Jules Vandeweyer, ready to go with our hobby cyclists to make a nice tour on Mallorca. Han Bulten, Lidewij van den Brule, Fred 268 km, Lea Guentner, Jasmine Schlüter, Norbert Schmitz, Peter Forstmeier, Letizia Rompelberg, Eugène Dellaert, Jochen Guentner, Siliva Forstmeier, Dieuwke Biesma, Henk Huijnskens, Jules Vandeweyer, Stan van den Brule and Douwe Biesma. 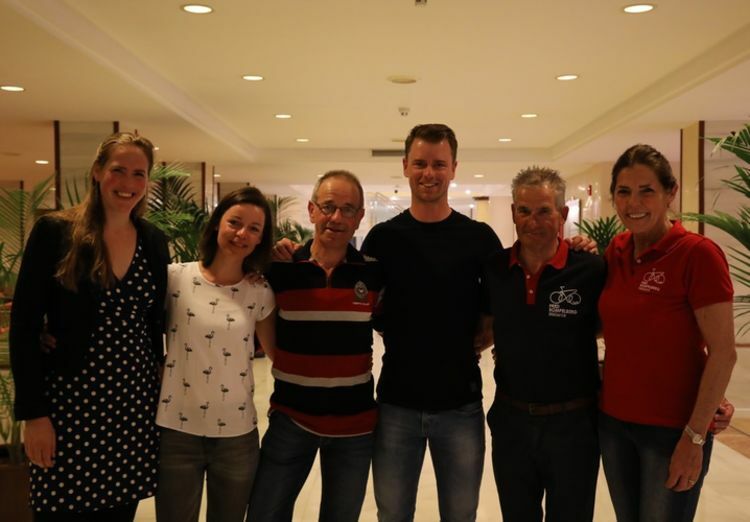 Piet Lighart, Jeanne Winthagen, Fred 268 km, Tara Fonk, Sonja Weller, Letizia Rompelberg, Jose Cremers, Marc Michaux, Annette Croonen and Oliver Harcy. 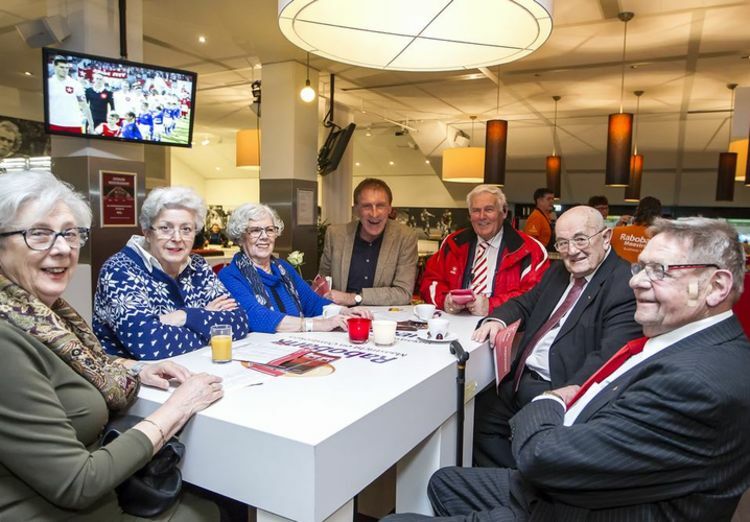 Tiny Laenen, Mia Vroomen, Kitty Dresens, Fred 268 km, Math Vleugels, Ben Laenen and Ernest Augustine during the football match in the business lunch of MVV. The match was won by MVV with 3-1.